He is a close aide to the North Korean leader. 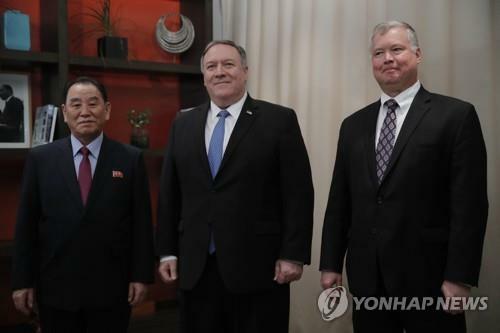 The State Department said later that the three had a "good discussion" on "efforts to make progress on the commitments President Trump and Chairman Kim Jong Un made at their summit in Singapore." A second summit would seek to break an impasse in negotiations over North Korea's nuclear weapons program. Trump and Kim held their first meeting in Singapore in June and agreed to work toward complete denuclearization of the Korean Peninsula in exchange for security guarantees for the regime. U.S. Vice President Mike Pence said Wednesday that the North has yet to take "concrete steps" toward dismantling its nuclear weapons.